Your browser does not support HTML5 audio. Please consider upgrading your browser. Welcome to our site! We would love to share our music with you. Check out our "Events" tab for upcoming concerts in your area. We have just moved to Madison, Wisconsin, where James will be commencing work towards a Doctorate of Musical Arts at the University of Wisconsin-Madison School of Music as a University Fellow. This move marks the end of a wonderful chapter of life living in uptown New York City - the place where we began making music together, fell in love, and had our baby girl, Sofia. We will miss NYC dearly, but we are also thrilled to tackle a new adventure in a new place. Stay tuned here and on our facebook page for updates, pictures, and concert announcements! 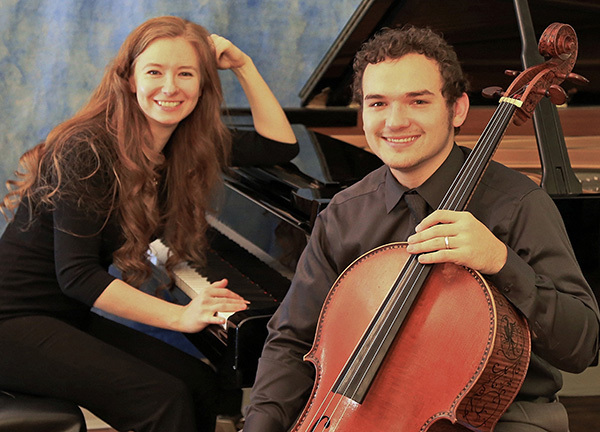 Pianist Alyona Aksyonova and cellist James Waldo are the A.W.Duo. Concertizing around the U.S. with increasing frequency, the duo loves exploring the rich musical literature and sonic possibilities for cello and piano. Based in New York City, the duo enjoys a diverse schedule of touring and festival appearances, chamber music collaborations with friends, commissioning and performing new works, and performing with the Listen Closely Chamber Music Initiative in their home neighborhood of Inwood in northern Manhattan. The A.W.Duo loves community! Whether playing in our home city or touring, we do our best to help bring positive change to the places we visit. We regularly work with towns, churches, universities, and other communities to organize benefit concerts for local causes. Our duo has helped various communities raise over $12,000 for local causes. Alyona and James began playing together in 2009, and were married in 2012, and recently have welcomed little Sofia into the family. They now make there home in the lovely midwestern city of Madison, Wisconsin. 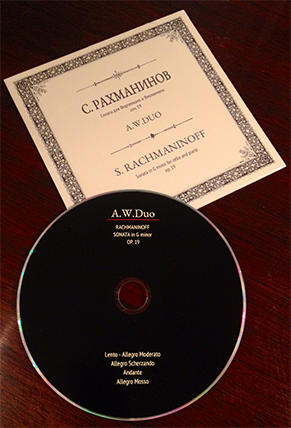 A.W.Duo plays the Sonata for Cello and Piano in g minor, Op. 19 by Sergei Rachmaninoff (1873-1943). Recorded Summer 2013. If you would like to order multiple copies please submit your order request to contact.awduo@gmail.com for a shipping quote. May 20th 2019 Charlotte, NC Center City Concerts at St. Peter's Free concert at one of our favorite venues! Brahms F Major Sonata and more!